Getting the right size capacitor for an electric motor could mean the difference between starting the motor or not. A motor needs a little bit of energy to start the rotation of its metal shaft. A capacitor is used to supply this initial push to the motor. Capacitors store energy and then releases it when the motor needs it. The size of capacitor needed for the job depends on the motor's energy starting requirement and the voltage applied to the motor. 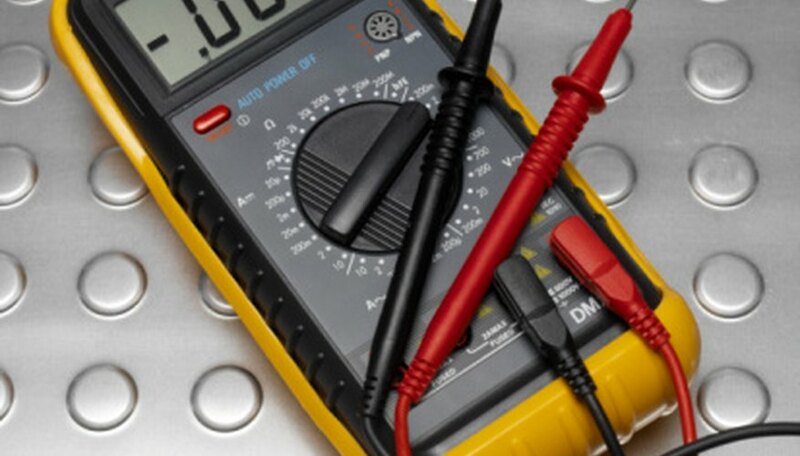 Turn on the digital multimeter. Change the measurement dial to the DC voltage setting denoted by a capital "V" with straight lines above it. Touch the red (positive) probe of the multimeter to the positive terminal of the battery that powers the motor. Touch the black (negative) probe of the multimeter to the negative terminal of the battery that powers the motor. Write down the voltage of the battery. For example, it might be 11.5 volts. Multiply 0.5 times the square of the voltage. Call this result "x.". Continuing the example, you have 0.5 times 11.5 volts times 11.5 volts, or 66.1 square volts for "x". Divide the start-up energy requirement, in joules, of the motor by "x" to arrive at the capacitor size needed in farads. The start-up energy of the motor is found either in its documentation or written on the motor itself. Assuming a start-up energy of 0.00033 joules, you obtain 0.33 divided by 66.1 which equals 5.0 times 10^-6 farads. The symbol "^-" denotes a negative exponent. Convert the capacitance to microfarads by dividing by 10^6, or one million, since a microfarad equals one-millionth of a single farad. The microfarad is the common unit for capacitors. Completing the exercise leads to 5.0 times 10^-6 farads divided by 10^6 microfarads per farad, or 5.0 microfarads. Hirsch, William. "How to Size a Capacitor to an Electric Motor." Sciencing, https://sciencing.com/size-capacitor-electric-motor-7994649.html. 24 April 2017.